The minor leagues never looked so major. In this compelling story of competition and sportsmanship, longtime journalist and baseball enthusiast Roy Rowan takes the reader inside the hearts and locker rooms of two of minor league’s hottest pitching prospects, pitching for the same team and against each other. On one mound there is Justin Olson, a product of Big Ten baseball and an academic star, whose fastball tops out at 94-miles-per-hour. On the other mound there is Francisco Liriano. Plucked from the sandlot ball fields of the Dominican Republic, he possesses one of the most threatening arms in the minors. His arsenal of pitches, including a devastating slider and a 97-mph fastball, humbles the hitters he faces. The two young men began the 2005 season as teammates, pitching for the New Britain Rock Cats of the Double-A Eastern League. But they are also adversaries locked in head-to-head competition for the same opportunity---a chance to move up the minor-league ladder and finally join the starting rotation of the Minnesota Twins. Together they form a story of big dreams and big heartbreaks as author Rowan follows them through the drama and pressure of life in one of the best farm systems in baseball. With deft poeticism, Rowan captures these “boys of summer,” traveling with the team through small towns and ballparks of America, exploring the culture that has reinvigorated the national interest in the minor leagues. 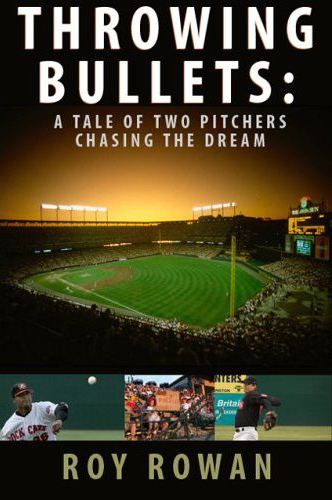 Destined to be a sports classic, Throwing Bullets takes the reader through the trials and tribulations of these two young pitchers. A vivid story of excitement, frustration, failure, and finally success---at least for the young Dominican---this book is an inside look at two minor-league lives in which every pitch is major.